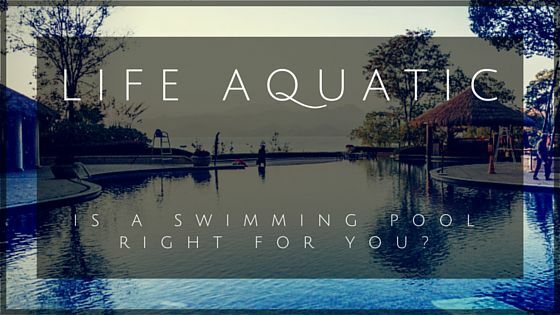 Life Aquatic: Is a Swimming Pool Right for Your Family? It is the best season here in the Delmarva area. We are close to amazing beaches and parks. We have lots of activities and events happening from April to October here in Rehoboth Beach. We have BBQ’s and parties, family reunions and the such. When you entertain in your own home during this season, how do you want your back yard to look? A swimming pool is a great aesthetic to build on. But there are many things that you need to consider, such as: budget, size of lot, and how much time you want to spend building this wonderful addition to your yard. Before hiring any Pool company to do the job, you want to ask yourself a few questions. 1) Do I have enough time to care for the pool? 2) Will my family use it enough? 3) What is it actually going to cost me, including decking and landscaping options? 4) What will my family use it for? 5) What kind of pool do we want? There is so much to consider when looking to install something that can be very permanent. But, you have options! There are Above-ground, In ground, Aluminum, Steel, Fiberglass, and Concrete. What is a poor pool buyer to do when there is so much to decide on? Typically, the least expensive option is the less permanent option. These pools are the summer fun answer to non-committal pool relationships. You can put them up quickly with some of your neighbors and host a pool party in a few days! You can choose from Aluminum, Resin or Steel sidings. 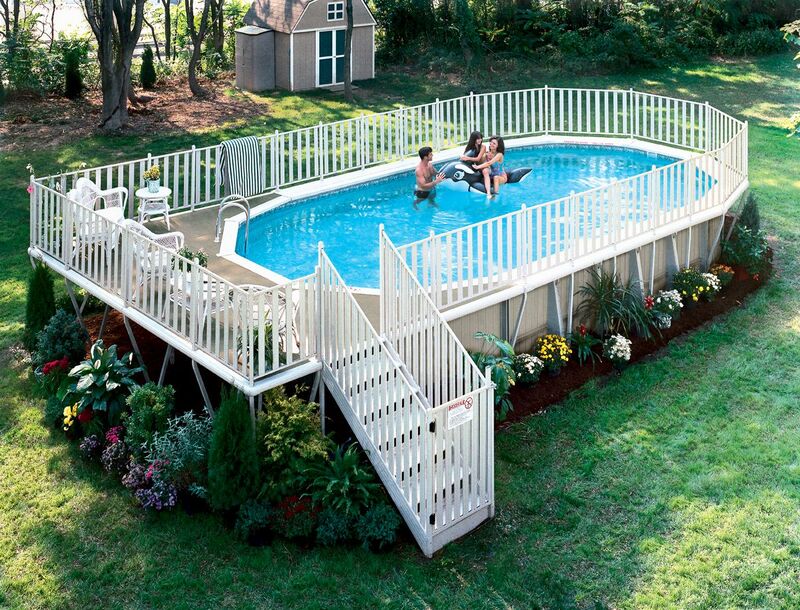 If you have a small lot, this is a good option since you can literally carry the pool into the backyard and assemble it. If you move, you can take your pool with you, give it to a friend or family member, or even sell it. In ground pools are typically more expensive than the above ground pool, yet they are a permanent improvement on the home. You can do anything with a little imagination and good landscaping. This one is generally more appealing to most people looking into installing a pool. They have a depth range of 3-20 feet, and various shapes, depending on what you are using it for. If you have a water sport family, you may want a play pool with sports set ups. Do you have a bunch of splashers and swimmers? Then maybe an L shaped pool to keep everyone happy. Do they just like to swim laps? Then maybe a rectangle design is best. Thinking about what it will be used for, will help in the designing and building process, and it will ensure that the entire family will be happy with the end result. Let’s just assume that you have chosen the in ground pool, and you have determined the size and shape. Now you need to determine the type of in ground pool that would be right for you and your family. Fiberglass pools are factory-manufactured, and installed in one piece in your yard when excavation is complete. It resembles a giant bathtub almost. These pools are generally more expensive to purchase than concrete in ground pools. But, these can save you money over the life of the pool. Fiberglass pools typically require less chemicals than a concrete pool. And you avoid plastering and liner replacement costs. Because of the non-porous surface, you do not need to brush the pool nearly as often as a plaster finished concrete pool. But, you do not need to brush a pebble finish concrete pool as often as a plaster finished pool. A concrete pool is built to your specifications buy the pool company you chose. This is the most common type of pool that you will see anywhere. Hotels have them, and homes have them. You can turn your patio into a backyard paradise with landscaping and waterfalls. These pools are constructed in stages including: pool layout and excavation, steel installation, plumbing installation, equipment set, gunite or shotcrete application, tile and coping installation, and interior finish installation. Even though these pools take longer than fiberglass pools to install, the end result is usually great as it has the advantage to take virtually any shape, size, and design. After the excavation, the panel walls are bolted or fastened together and supported at the bottom by a concrete footing. The vinyl liner is spread over the interior of the pool and covers the floor and paneled walls. It is then connected to the top of the panel walls by a vinyl rib the outside edge of the liner. 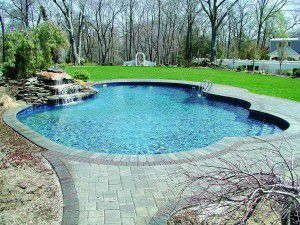 These types of pools are popular in cold areas of the country and can be easily winterized by draining them down halfway and covering until spring. The vinyl liner is smooth and non-porous, making stain removal easy if stains are treated promptly. Pool covers are great additions to your pool area. One of their main benefits can be increased safety. 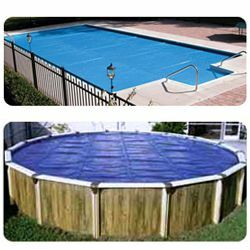 Covers come in many varieties and can extend the swimming season of your pool by several weeks by retaining the solar heat that is generated each day. If your pool is underneath a large tree covering, or even If there are trees nearby, a solar cover will help keep the pool free of leaves and other debris. You can enjoy year round swimming in milder climates by adding a heater to your pool set up. As far as filters go, there are many types designed to meet the particular needs of your pool. Your pool builder will help you choose the right one for your pool. So, as you can see there are many choices and options for your pool. So take a deep breath, and dive on in to making one of the best decisions you ever could. You will be glad you did.